Exciting news!! I am bringing my second solo show; BRING THE THUNDER to the Soho Theatre in London from 17th – 21st April, ahead of my full UK tour later this year, get your tickets here NOW!! CLICK THIS LINK FOR TICKETS!! 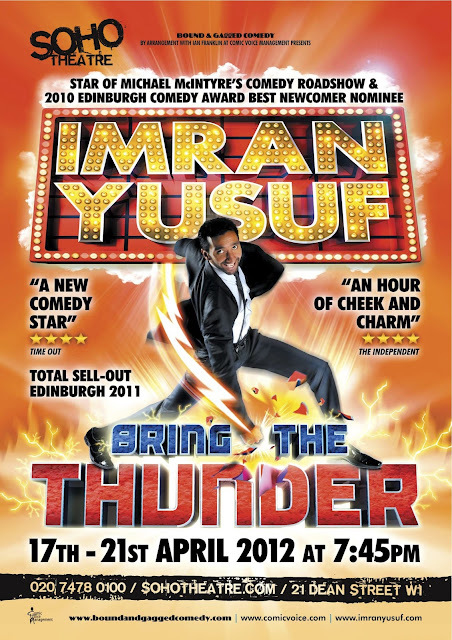 Following the sell-out success of Imran Yusuf’s first two full-length comedy shows at The Edinburgh Festival Fringe and the popularity of his debut UK Tour in 2011, Imran is delighted to present his second show, Bring The Thunder!! for a week at London’s Soho Theatre in Spring 2012. The sequel to his 2010 Edinburgh Comedy Award Best Newcomer nominated show, An Audience With Imran Yusuf, this is a show about pursuing your dreams and ambitions with unrelenting enthusiasm and perseverance.Motivating, inspiring and 100% comedy!